If I have one complaint about the proliferation of craft cocktail bars, it’s that many of the mixologists tend to shun perhaps the most versatile and tasty base spirit of them all. Of course, I’m talking about rum. 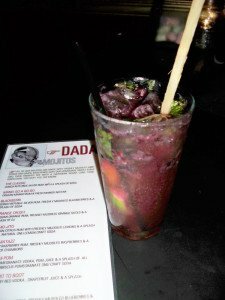 So when I heard that Dada in Delray Beach – already one of the best spots for mojitos in South Florida (not to mention the award-winning food) – was expanding its bar menu to include new rums and cocktails, I regained my faith in the new cocktail culture. It took a while to get down there to check out the offerings, but on a recent visit I was pleasantly surprised at the quality and variety of the drinks. Pairing them with delicious food and lounging in Dada’s outdoor dining area only enhanced the experience. While Dada is often mentioned among the top restaurants to grab a cocktail, and boasts some acclaimed bartenders, it’s typically not mentioned in the same breath as some of the area’s top craft cocktail spots. The mojitos are great, but there was nothing there for those who prefer a classic, or something a little less fruity. That all changed last summer, when Dada released its own line of small-batch spiced rums. The new rums, featuring herbs from the restaurant’s garden, were immediately employed in the popular mojitos. 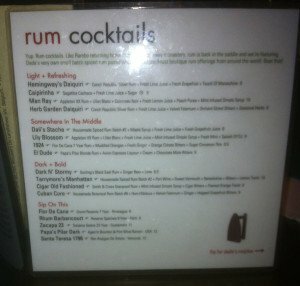 But the folks at Dada took it a step further with a totally new retro cocktail menu and accompanying rum list. Rum was a perfect fit for the restaurant, a 1920s-era house that’s been restored to evoke the era of the early 20th century Dada art movement. Our course, that same time also featured Prohibition, rum-running, Ernest Hemingway, and other touchstones in the rise of rum as a popular spirit. Besides the housemade spiced rums (Batch #2 and Batch #6), the menu offers five top-of-the-line sipping rums: Flor De Cana (Nicaragua), Rhum Barbancourt (Haiti), Zacapa 23 (Guatemala), Papa’s Pilar Dark (U.S.), and Santa Teresa 1796 (Venezuela). The bartenders also pair their house rums with some fine premium mixing rums in the new cocktails, which is where my interest was focused during a visit recent visit with friends. I started with a Cigar Old Fashioned, featuring one of my favorite rums (Smith & Cross, Navy proof from Jamaica) along with mint-infused simple syrup, cigar bitters, and a flamed orange twist. A traditional rum-heavy drink, this definitely started the evening off on the right foot. If I were a smoker, it would have paired nicely with one of Dada’s house-brand hand-rolled cigars. Even more adventurous but still very traditional is Mr. Tarrymore’s Manhattan (Housemade Spiced Rum Batch #2, port wine, sweet vermouth, benedictine, bitters, lemon twist). 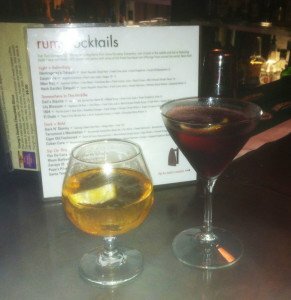 The spiced rum was a nice accompaniment to the tart wines and herbaceous liqueur. Those two drinks are in the The “Dark + Bold” section of the menu, along with a traditional Dark N’ Stormy (also well-received by our group). The bar was out of Batch #6, so I couldn’t sample the Cuban Cure (rum, hibiscus, falernum, ginger, grapefruit bitters). Hopefully I can try one next time. The 12 cocktails are divided into three sections of four each. The “Light + Refreshing” drinks feature two daiquiris (including a Hemingway version), a Caipirinha, and Man Ray – a creative original that I’d like to try on my next visit. It features Appleton VX rum, Lillet Blanc, Cointreau, lemon juice, peach puree, and mint-infused simple syrup). 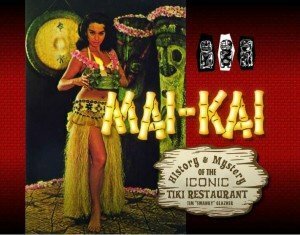 The daiquiris include top-notch ingredients such as fresh juices, maraschino liqueur, and falernum. From the “Somewhere in the Middle” section, I was least impressed with 1924 (Flor De Cana 7 rum, muddled oranges and fresh ginger, orange bitters), which seemed a bit muddled itself. But I was pleased with Dali’s Stache (Housemade Spiced Rum Batch #2, maple syrup, fresh lime and grapefruit). It was both sweet and tart, and it paired nicely with some of the decadent small plates from chef Bruce Feingold’s kitchen. I enjoyed a variety of dishes, such as 5 Spiced Bacon Sticks (with apple, blue cheese and spiced tomato jam), Short Rib Flatbread, and The Fondue (pretzel bread, fruit and veggies). If you’re a bacon lover, you have to try the completely-over-the-top dessert called The Bunny (sticky brownie, 5 Spiced Bacon Sundae, vanilla ice cream, bacon caramel). It has to be tasted to be believed. If you’re looking for an after-dinner drink, try El Dude (Papa’s Pilar Blonde rum, Avion espresso liqueur, cream, chocolate mole bitters), which got a thumb’s up from our group. 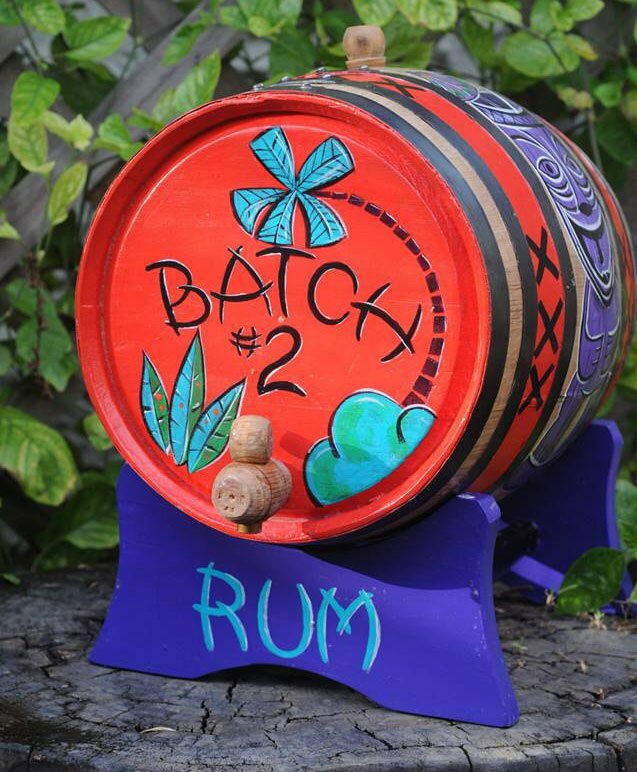 Traditional Caribbean-style rum bars, especially those here in South Florida, tend to have a poor reputation for well-made cocktails. 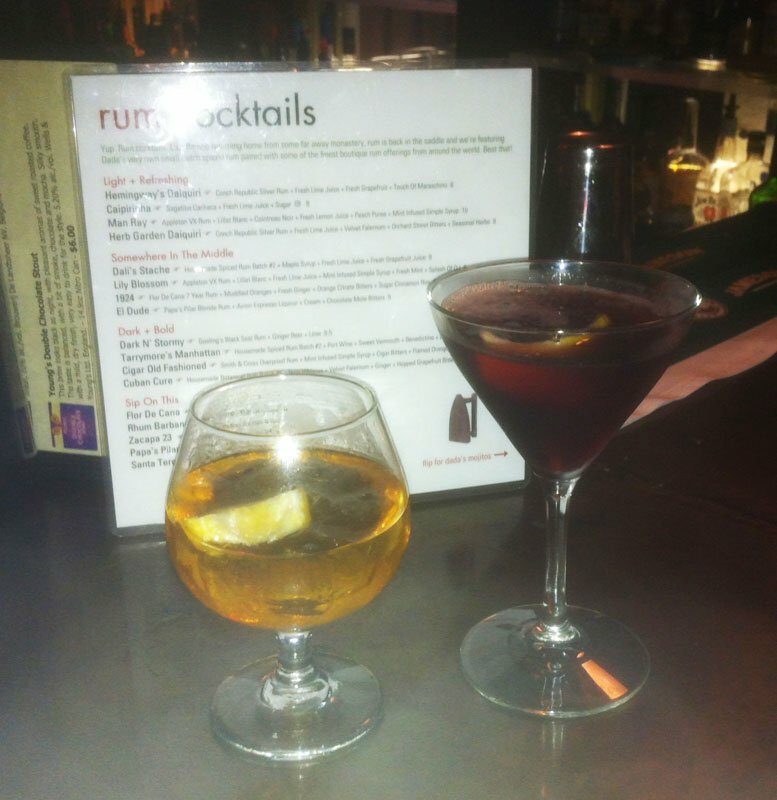 I found a glaring example at a much-touted bar in downtown West Palm Beach (since closed) that had a great rum selection but not a clue as to how to make a drink. (I tried to order a classic daiquiri and was told they didn’t have fresh limes.) So it’s heartening to see a place like Dada get it right when it comes to crafting tasty, balanced rum drinks. After a couple drinks at the cozy bar inside, we dined outside in what used to be the front yard of the historic house, not far from the herbs that went into the food and cocktails. It’s a unique experience in South Florida, elevated just a notch higher by the new rums and cocktails. Dada is at 52 N. Swinton Ave. in Delray Beach. Open seven days a week from 5 p.m. to 2 a.m. Reservations recommended on busy nights. Call (561) 330-3232. This entry was posted in Cocktails, Food, Restaurants, Reviews, Rum and tagged cocktails, craft cocktails, Dada, dark rum, falernum, Flor De Cana, mojito, Papa's Pilar, rum, Santa Teresa Rum, Smith & Cross, South Florida, spiced rum. Bookmark the permalink. I agree with you about the dearth of rum on most cocktail menus. Even in my home bar, I tend to lean toward the rye/whiskey drinks. But Smith and Cross and other rums are such fine spirits that they deserve a bigger place, even in the classic-style cocktail bars. Rum isn’t just for tiki drinks, after all! Thanks for spreading the word about great cocktails!